How I got it: Found a copy at a local book store! So this summer I made a mini goal of tackling books that have been on my shelf/list for more than a year. Whether they are super long (The Historian) or not quite genre's I'm interested in anymore (White Oleander) or in this case- hard to find and kind of intimidating. I have been intimidated by We for awhile because it is the foundation block of my favorite genre: dystopian literature. And I'm not talking about contemporary dystopian stories like The Hunger Games (which don't get me wrong - I love a lot) but he was threatened by communist Russia for writing this kind of literature. People claimed that this book predicted Stalinism. It has been claimed that this book inspired 1984 and Brave New World. I've been putting this book off for awhile. What if I didn't understand it? What if I didn't like it? After a Two Hundred Year War society, One State, has been rebuilt under the guidance of the Great Benefactor. Humans are no longer people they are numbers. The main character, D-503, is the main builder of the spaceship Integral to bring the order of One State to other planets. Every minute of a person's life is planned out by the Table of Hours. I really enjoyed this book. It wasn't perfect- there were a lot of things that I wish had more details or development. Sometimes the writing was choppy and hard to follow (although- that could be the translation and not the original). There were a few times where I had to pause and go "wait what just happened?" I found it really exciting to know the history of the book and see how this truly was a scary predictor of Stalinist Russia (the history geek in me was quite happy). I also could see how some of my favorite books were inspired by this book. If you are looking for a book that's a bit of a challenge but has some interesting history behind it- I would definitely recommend this one! I'm going to keep an eye out for this to come my way. It sounds great. I love the dystopian stuff of now too, but also love looking at older works. I just finished The Handmaid's Tale (again) (awesome). Thanks for your review! Thank you so much for finally providing a review of this one :-) I've been looking for it for such a long time especially because I also love the "classic" dystopian fiction and this is definitely a classic, but none of the book bloggers I follow seem to have read it. Oh I read this one a year or two ago and I never knew anyone else who read it! I agree, there was some choppiness to it, but I think that's a translation problem and not a writing problem. Glad you liked it! 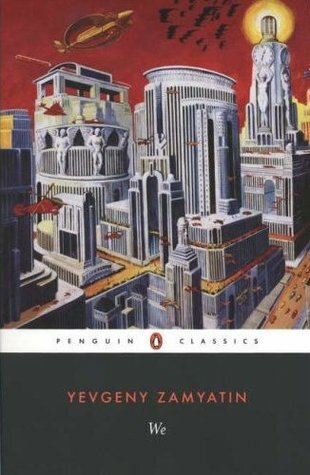 I enjoyed this book, and respected it as the inspiration for future dystopians, but ultimately other authors have improved upon this book immensely. 1984 and Brave New World are far superior. This has the ideas, but lacks the execution.